Hello and thanks to That’s What I’m Talking About for letting me be here today! I’m Z.A. Maxfield, coming at you from lovely sunny southern California where I’m blogging about my latest release, Home The Hard Way. I’m doing a giveaway and there are a couple different ways to win! At each tour stop, one lucky winner will get to choose any book from my backlist, so if you’re new to Z.A. Maxfield, this is a great way to find out if you want to dive in! At the end of the tour, I’ll be giving away a Riptide gift certificate, so you’re going to want to follow along the whole blog tour HERE for your best chance at a prize! Here’s the blurb for Home the Hard Way: Dare Buckley has come home—or at least, he’s come back to Palladian, the small town he left as a teenager. After a major lapse in judgment forced him to resign from the Seattle PD, Palladian is the only place that’ll hire him. There’s one benefit to hitting rock bottom, though: the chance to investigate the mystery of his father’s suicide. The giveaway is open during the time specified on the Rafflecopter form. Winner(s) chosen at random from all eligible entries. This contest is open internationally where not prohibited by law. Open to participants, 18 years or older, who are legally allowed to participate in such a contest as allowed by their local laws. All federal, state, local, and municipal laws and regulations apply. Void where prohibited. No purchase necessary. By participating in the contest, participants agree to be bound by the decisions of the contest sponsor. Prize will be delivered by the author and/or publisher. This blog nor its reviewers or owner are not responsible for items lost in the mail. By entering this giveaway, participants agree to abide by these terms. 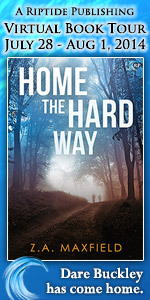 Be sure to come back later today for B.’s review of Home the Hard Way!! 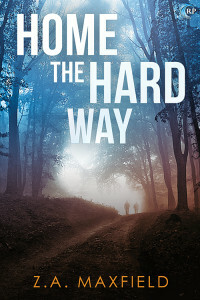 I am really looking forward to reading Home the Hard Way! Thanks for the giveaway! Two roads diverged in a wood, and I— I took the one less travelled by, And that has made all the difference. Thank you for a chance of winning a book from ZAM’s backlist and thank ZAM for such an interesting tour and this new mystery book – I hope there will be some more from Palladian? New ZAM is always a treat!